Forces and mechanical properties play a central role in many biological processes covering a huge range of length and time scales: from the movement of whole organisms over the adhesion, migration, proliferation of cells, down to the mechanics and interactions of single molecules. For example, cells are able to sense external forces (mechanosensing), translate these mechanical forces into biochemical signals (mechanotransduction) and react to these signals (mechanoresponse). In this talk, I will first focus on recent work in my lab related to mechanical interactions between cells and the extracellular matrix (ECM) critical to the metastasis of cancer cells. To assess the mechanical interplay between the cells and ECM during invasion, we combined confocal fluorescence microscopy and atomic force microscopy (AFM) indentation to determine the Young’s moduli of individual embedded cells and the pericellular matrix using novel analysis methods for heterogeneous samples. tissue samples. Primary tools for this are multi-photon microscopy and second-generation imaging. In the second part of my talk, I will present a novel non-linear 3D optical super resolution technique based on image scanning microscopy (ISM) and demonstrate the excellent sensitivity at high frame-rates in combination with a two-times improved lateral resolution compared to a classical non-linear laser-scanning microscope. Dr. Robert Ros is a Professor for Physics at Arizona State University. 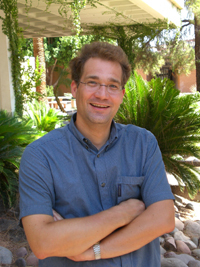 He joined ASU in 2008 from Bielefeld University as Associate Professor for Physics. He is an experimental biophysicist with expertise in force spectroscopy, and the combination of AFM with con focal microscopy. His research interests in the field of nanobiophysics includes structural biology, physics of molecular recognition, conformational dynamics of single (bio-)molecules and cell mechanics using scanning probe methods, force spectroscopy technologies, fluorescence microscopy, and nanophotonics.